Buffering to achieve pH control is crucial for successful trichloroethene (TCE) anaerobic bioremediation. Bicarbonate (HCO3−) is the natural buffer in groundwater and the buffer of choice in the laboratory and at contaminated sites undergoing biological treatment with organohalide respiring microorganisms. However, HCO3− also serves as the electron acceptor for hydrogenotrophic methanogens and hydrogenotrophic homoacetogens, two microbial groups competing with organohalide respirers for hydrogen (H2). We studied the effect of HCO3− as a buffering agent and the effect of HCO3−-consuming reactions in a range of concentrations (2.5-30 mM) with an initial pH of 7.5 in H2-fed TCE reductively dechlorinating communities containing Dehalococcoides, hydrogenotrophic methanogens, and hydrogenotrophic homoacetogens. Rate differences in TCE dechlorination were observed as a result of added varying HCO3− concentrations due to H2-fed electrons channeled towards methanogenesis and homoacetogenesis and pH increases (up to 8.7) from biological HCO3− consumption. Significantly faster dechlorination rates were noted at all HCO3− concentrations tested when the pH buffering was improved by providing 4-(2-hydroxyethyl)-1-piperazineethanesulfonic acid (HEPES) as an additional buffer. Electron balances and quantitative PCR revealed that methanogenesis was the main electron sink when the initial HCO3− concentrations were 2.5 and 5 mM, while homoacetogenesis was the dominant process and sink when 10 and 30 mM HCO3− were provided initially. Our study reveals that HCO3− is an important variable for bioremediation of chloroethenes as it has a prominent role as an electron acceptor for methanogenesis and homoacetogenesis. It also illustrates the changes in rates and extent of reductive dechlorination resulting from the combined effect of electron donor competition stimulated by HCO3− and the changes in pH exerted by methanogens and homoacetogens. Organohalide respiring microorganisms represent a unique, efficient, and sustainable approach to detoxifying chloroethenes contamination from soil, water, and groundwater[1–3]. These microbes are important because they can use priority pollutants such as trichloroethene (TCE), dichloroethene (DCE), and vinyl chloride (VC) as electron acceptors for energy metabolism. Dehalococcoides bacteria hold a prominent role among the organohalide respirers isolated to date, as these are the only ones having the proven ability to detoxify chloroethenes to the innocuous end product, ethene[1, 5]. Dehalococcoides have a constrained metabolism; they strictly utilize hydrogen (H2) as the electron donor and acetate as the carbon source. The most common method for delivery of H2 and acetate at bioremediation sites is by addition of fermentable substrates as precursors[2, 7, 8]. H2 gas has also been supplied for groundwater field applications and in engineered ex situ treatment technologies for chloroethenes remediation[10–12]. In systems fed with H2, the pH tends to rise as a result of competing biological reactions, whereas dechlorination and/or fermentation of H2-releasing compounds decrease the pH. As a consequence, buffering and pH management are important parameters for assessing in situ and ex situ remediation approaches, and are crucial for sustained dechlorination[12–14]. In groundwater, dissolution of carbonate (CO32−)-containing minerals serves as the natural pH buffer. Among the CO32− species, bicarbonatea (HCO3−) is the most abundant at neutral pH, and it contributes substantially to the alkalinity of groundwater. Typical HCO3− concentrations in groundwater are in the range of 0.7-10 mM[15, 16]. 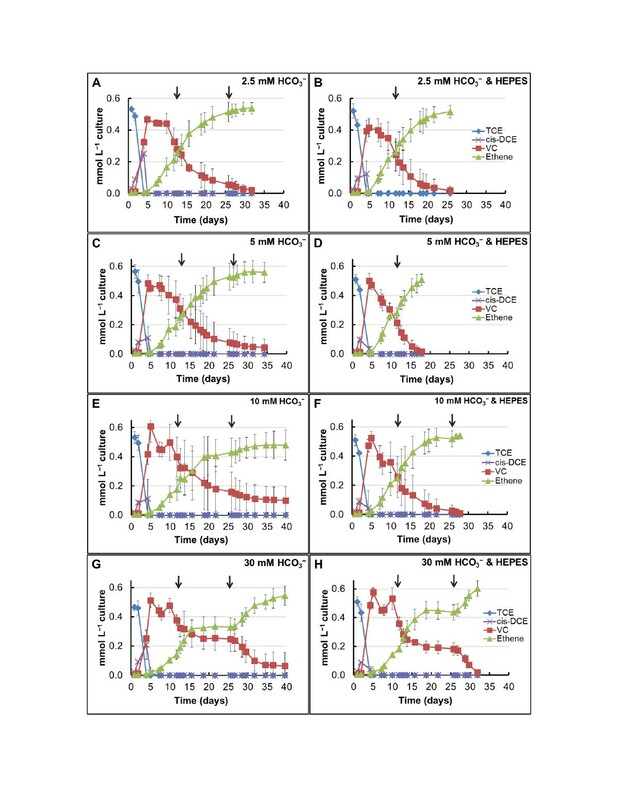 Additionally, HCO3− is supplemented to groundwater as a common strategy when biostimulation or bioaugmentation are employed in order to buffer the protons produced by the biological reactions[2, 8]. The competition for H2 among organohalide respirers and methanogens has been well documented[22–28]. However, none of these studies have addressed how consumption of H2, whether added as gas or as a result of fermentation, is affected by varying HCO3− concentrations. They, too, compete for H2 with organohalide respirers. To date, the limited number of studies that have investigated hydrogenotrophic homoacetogenesis in TCE dechlorinating consortia[27, 31] has not included the HCO3− concentration as a variable driving the extent and the rates of reductive dechlorination. Hydrogenotrophic methanogens and homoacetogens can also affect pH in dechlorinating communities. Methanogens produce methane as the end product (Equation 1) by expending one proton and one HCO3−, while hydrogenotrophic homoacetogens generate acetate (Equation 2) from one proton and two HCO3−. Both reactions increase the pH while consuming HCO3−, which often is the only buffer in the system. The effect of HCO3− concentration in TCE dechlorinating microbial communities has not been studied. Few studies focusing on other dechlorinating systems have recognized its importance and examined the effect of HCO3− concentrations on the formation of chlorinated daughter products, thus motivating this work. For example, removal of chlorophenols from simulated wastewater in upflow anaerobic sludge blanket (UASB) reactors revealed significant inhibition on dechlorination at high HCO3− (3500 mg L−1 as CaCO3) and high pH. In microcosms showing microbial dechlorination of polychlorinated biphenyls with H2 gas as electron donor, 100 mg L−1 HCO3− (1.64 mM) yielded the fastest rates of dechlorination, whereas addition of 1000 mg L−1 HCO3− (16.4 mM) resulted in the slowest polychlorinated biphenyls dechlorination rates and triggered the most acetate to form. In this study, we evaluate the role of HCO3− as a buffering agent and as an electron acceptor in TCE reductively dechlorinating mixed communities using a previously described culture, DehaloR^2, as a model consortium. H2, and not fermentable substrates, was used as the sole electron donor to directly and accurately measure hydrogenotrophic production of methane and acetate from HCO3−. The concentrations of HCO3− tested reflect typical groundwater concentrations (2.5-10 mM), as well as commonly reported laboratory concentrations (30 mM). The time course dechlorination measurements presented in Figure1 show a short lag time for the onset of dechlorination of 0.55 mmol L−1 TCE. TCE to cis-DCE conversion was the fastest dechlorination step in all cultures, with only VC and ethene detected after day 5, regardless of the concentration of HCO3− added. A close monitoring of VC to ethene reduction rates between each GC measurement revealed that after day 5, dechlorination rates had slowed down at all HCO3− concentrations, especially in the cultures containing 30 mM (Figure1G-H), suggesting an electron donor limitation. The measured H2 levels on day 12 were 1.5 mmol L–1 at 2.5 mM HCO3− and 0.5 mmol L–1 at 5 mM HCO3−. At 10 and 30 mM HCO3−, no H2 peak was detected on the GC-TCD on day 12. Immediately after injecting an additional 8.2 mmol L–1 H2 on day 12, we observed an increase in the rates of VC consumption and ethene formation (Figure1A-H). Chloroethenes dechlorination at different HCO 3 − concentrations. Time course of chloroethenes dechlorination to ethene in cultures amended with H2 as the sole electron donor and with HCO3− buffer (graphs A, C, E, and G) and a combination of HCO3− and HEPES buffers (graphs B, D, F, and H). The arrows represent the 2nd and 3rd addition of 8.2 mmol L−1 H2. The error bars are standard deviations of triplicate cultures. Following the second addition of H2, all cultures reached ≥70% conversion of TCE to ethene. Complete TCE dechlorination (Figure1D) was first observed between days 17 and 18 in cultures containing 5 mM HCO3− and 5 mM 4-(2-hydroxyethyl)-1-piperazineethanesulfonic acid (HEPES), which was provided as an additional buffer. Complete conversion to ethene was further observed in the cultures with 2.5 mM HCO3− & HEPES on day 26. A threefold increase in the 16S rRNA Dehalococcoides genes (data not shown) from 1.13 × 1011 (±4.98 × 109) copies L−1 (time 0) to 3.71 × 1011 (±2.78 × 1010) and 3.67 × 1011 (±8.04 × 109) copies L−1 was detected after complete dechlorination at 5 mM HCO3− & HEPES and 2.5 mM HCO3− & HEPES, respectively. Chloroethenes conversion rates in the cultures containing 10 and 30 mM HCO3− were the slowest, as seen in Figure1. The Dehalococcoides 16S rRNA gene copies per L in the cultures with HCO3− and HEPES after complete conversion to ethene were 2.07 × 1011 (± 5.79 × 109) at 10 mM and 2.03 × 1011 (± 5.59 × 109) at 30 mM (data not shown). The lower resulting cell density coupled to decreased dechlorination rates indicates that Dehalococcoides growth was diminished at the higher HCO3− concentrations (Student’s t test; ≥70% confidence level). We observed a second H2 limitation at 10 and 30 mM HCO3−, with the complete cessation of VC reduction at 30 mM between days 18 and 26 (Figure1G-H). Consequently, an additional dose of H2 (8.2 mmol L–1) was injected into all cultures still undergoing dechlorination. With the 3rd addition of electron donor, the 10 and 30 mM HCO3− cultures supplemented with HEPES dechlorinated all TCE to ethene by day 28 and 32 (Figure1F and H), respectively. The parallels without HEPES showed incomplete conversion to ethene even by day 40 (Figure1E and G) and VC dechlorination had stalled once again on day 35, or it was proceeding at very reduced rates. In Figure1, we show how H2 was limiting dechlorination rates before the 2nd and 3rd H2 addition at the different concentrations of HCO3− tested. The theoretical H2 demand for 0.55 mmol L−1 TCE is 1.65 mmol L−1H2. Considering that the H2 at time 0 was 8.2 mmol L−1, five times in excess of the theoretical demand for dechlorination, the slower dechlorination rates observed, together with H2 depletion, indicated that competing microorganisms were consuming H2 faster than the dechlorinators. An increase in methane of only 0.01 mmol L−1 was detected at all HCO3− concentrations before day 4 (Figure2A), which coincides with the disappearance of TCE and formation of less chlorinated daughter products (Figure1). The lack of methane production was also confirmed by the qPCR data which show no relative increase in the numbers of Archaea gene copies L−1 at this time point compared to the 10% inoculum (Figure2B, day 7). The lag time for methane production could have been due to the previously reported longer lag time of the methanogenic microorganisms and the toxic effect of TCE on methanogens. Additionally, besides Dehalococcoides, other dechlorinators can use TCE as electron acceptor and H2 as electron donor to produce cis-DCE. A competitive advantage of Geobacter spp., the other identified TCE to cis- DCE respirers in the inoculum culture, over methanogens could have also contributed to a delayed onset of methanogenesis. Methanogenesis and homoacetogenesis during active evolvement of reductive dechlorination. Methane (A) and acetate (C) production during reductive dechlorination in medium buffered with 2.5 (circles), 5 (triangles), 10 (squares), and 30 (diamonds) mM HCO3−. The error bars are standard deviations of triplicate cultures and the arrows represent the 2nd and 3rd addition of 8.2 mmol L−1 H2. Quantification of methanogens, Archaea (B), and homoacetogens, FTHFS (D) using qPCR. The error bars are standard deviations of triplicate analytical runs. Methanogenesis was mostly stimulated at 2.5 mM HCO3− and 5 mM HCO3−, and it was less active with increasing concentrations of HCO3− (Figure2A). The methane production trends observed are supported by a higher increase in Archaea numbers at the lower HCO3− concentrations (2.5 and 5 mM in Figure2B) compared to 10 and 30 mM (Figure2B). At 30 mM HCO3−, we detected no net increase in methane between day 10 and 12, suggesting that methanogens, like dechlorinators, were also experiencing H2 limitation. Once H2 became available after the second addition, methane production rates quickly increased in all cultures (Figure2A). Upon the third addition of H2 (day 26), methane no longer increased at 2.5 mM HCO3− even though H2 was provided (Figure2A, day 26–32), indicating a HCO3−, and not a H2 limitation. Even though HCO3− was not measured due to analytical limitations, we were able to track HCO3− consumption via production of methane and acetate, as illustrated in Additional file1. 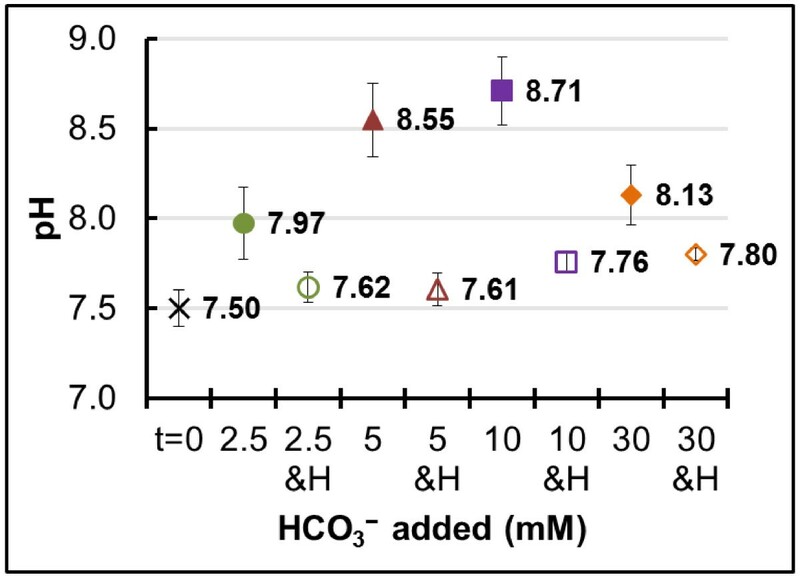 The HCO3− utilization balance presented in Additional file1 shows that production of methane (and to a lesser degree acetate) exhausted all the HCO3− in the systems initially supplemented with 2.5 mM. Homoacetogenesis exhibited the opposite trend to methanogenesis. According to the time course concentrations recorded and shown in Figure2C, more acetate was produced when more HCO3− buffer was present. Additionally, among all conditions tested, the greatest increase in copies L−1 culture by day 7 of the formyltetrahydrofolate synthase (FTHFS) gene, a functional marker for acetogens, was detected at 30 mM HCO3− (Figure2D), and the relative numbers of gene copies were lower with decreasing concentrations of HCO3−. Before the second addition of H2, all cultures showed an increase of 0.3-1.3 mM acetate (Figure2C). However, after injecting the second dose of H2, only a small rise in acetate was observed at 2.5 and 5 mM HCO3−. In contrast, at 10 and 30 mM HCO3−, we detected a boost in homoacetogenesis (Figure2C) and corresponding higher increases in the FTHFS gene (Figure2D). The qPCR data for both methanogens and homoacetogens correlate well with our analytical data. The resulting increased levels of homoacetogens coupled to the lowest levels of methanogens at 30 mM HCO3− indicate benefits for the first group at the higher HCO3− concentrations. Unlike homoacetogens, the resulting methanogenic microorganisms were present at similar levels in cultures initially containing 2.5 and 5 mM HCO3− and less plentiful in cultures initially containing 10 and 30 mM HCO3− (Figure2B). Overall, our findings are consistent with the lower HCO3− requirement for methane production: one mol HCO3− consumed for one mol methane (Equation 1) vs. two mol HCO3− consumed for one mol acetate (Equation 2). Additionally, these data are in agreement with the findings of Florencio et al., 1995 on substrate competition between methylotrophic methanogens and methanol-utilizing acetogens in UASB reactors, where acetogenesis was significant and outcompeted methanogenesis only in the presence of exogenously supplemented HCO3−. The fate of electrons fed as H2 is depicted in Figure3. By day 12 (after one addition of H2; Figure3A), 70% or greater of the total added electrons can be accounted for towards the three main energy-deriving reactions, dechlorination, homoacetogenesis and methanogenesis, under all conditions tested. Biomass was not included in these balances, however, a 10-20% fraction of the total electrons can be assumed for cell synthesis. 1.65 mmol H2, the theoretical H2 requirement for dechlorination of 0.55 mmol TCE, equals to 3.3 me- equivalents H2, and each 8.2 mmol L–1 H2 addition represents 16.4 me- equivalents. Out of the three main processes occurring in our test systems, TCE dechlorination utilized a small fraction of 9.3% out of the total me- equivalents for the cultures that completed dechlorination with two H2 additions (Figure1B and D), and 6.7% of the total me- equivalents for those that received three H2 additions (Figure1A, C, E, F, G, and H). Distribution of electrons fed as H 2 towards dechlorination, methanogenesis, and homoacetogenesis at various HCO 3 − concentrations. (A) Average data from triplicate cultures on day 12 after addition of 16.4 me- equiv. H2 (8.2 mmol L−1). (B) Average final data from triplicate cultures after addition of 33 me- equivalents (16.4 mmol L−1 H2 in 2.5 mM HCO3− & HEPES and 5 mM HCO3− & HEPES) and 49 me- equivalents (32.8 mmol L−1 in all other sets). The presence of the additional buffer, HEPES, is denoted as H on the X-axis. From the H2 me- equivalents provided at time 0, only 18.3% would have been required to completely reduce TCE to ethene. As seen in Figures1 and3A, none of the cultures, regardless of their H2 demand, completed dechlorination with the initial H2. Additionally, the 10 and 30 mM HCO3− amendments with or without HEPES received H2 fifteen times in excess of the theoretical demand for dechlorination, yet only the sets supplemented with HEPES completed dechlorination, implicating an important pH factor, which is discussed in the next section. Overall, the fate of most H2 me- equivalents was to HCO3−-driven reactions towards the production of methane and acetate. Acetate from hydrogenotrophic homoacetogenesis was also found to be the main sink of electrons in a field study that used H2 gas for remediation of chlorinated ethenes in groundwater. Moreover, Duhamel and Edwards 2007 investigated the growth and yields of hydrogenotrophic methanogens, acetogens and dechlorinators during the process of dechlorination. The authors found that most of the electrons fed as methanol in 30 mM HCO3- buffered medium went towards acetogenesis and, that methanogens were outcompeted by acetogens. Our data from 10 and 30 mM HCO3− corroborate their findings; however, one important additional finding from our experiments, as seen in Figure2 and3, is that methanogens can outcompete homoacetogens at low HCO3− concentrations (2.5 and 5 mM). 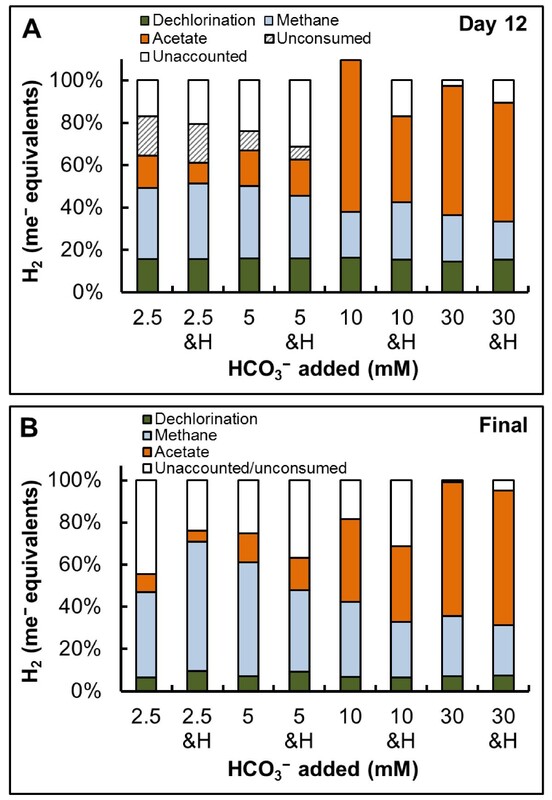 The results on TCE dechlorination, methanogenesis and homoacetogenesis from this work at different HCO3− concentrations offer some insights into which competing microbial groups will prevail and how HCO3− consumption affects rates of dechlorination. Furthermore, our study also alludes to how HCO3− drives the H2 competition between organohalide respirers, methanogens, and homoacetogens. This important aspect has not been determined previously in reductive dechlorination, to our knowledge. In addition, for application purposes, it is important to consider how temperature could affect these findings, as these predictions might be somewhat different at lower temperatures, such as those in groundwater. Our experiments were performed at 30°C, however, temperature studies on organohalide respirers (i.e. Dehalococcoides) have documented slower rates of dechlorination at 10-15°C compared to their maximum rates at 30-35°C. Homoacetogens are even greater H2 and HCO3− consumers than methanogens at lower temperatures[34, 38], hence, the predominance of homoacetogens would be greater in groundwater systems. Furthermore, because many homoacetogens can consume fermentables and/or H2 to produce acetate, it is important to consider homoacetogenesis as an electron sink and alkalinity-consuming process in dechlorination at the laboratory and field scale. Although comprehensive models on in situ reductive dechlorination have been developed[13, 14, 22, 39], the introduction of hydrogenotrophic homoacetogenesis in these models has not been considered. We supplemented HEPES to all HCO3− concentrations tested to separate between the effect of HCO3− as an electron acceptor/sink and the effect of pH changes resulting from microbial processes that use HCO3− as an electron acceptor, i.e. methanogenesis and homoacetogenesis. 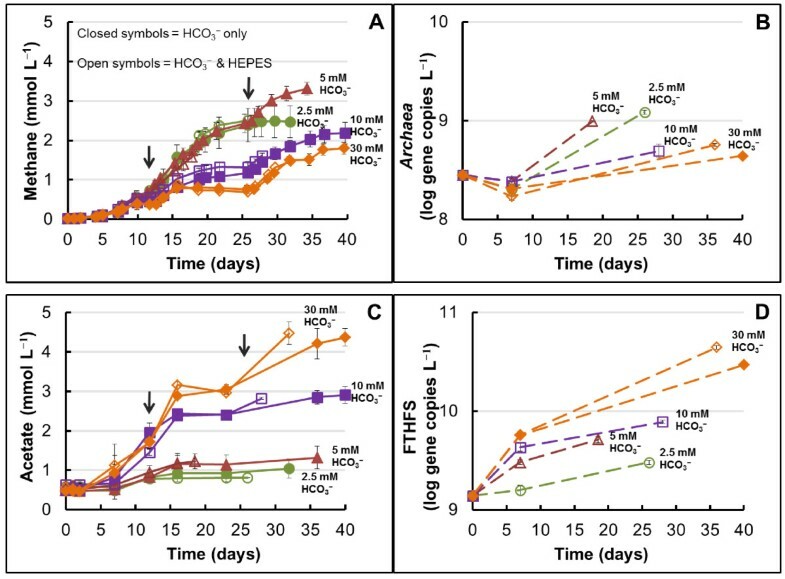 The time course pH measurements presented in Additional file2 and the final measurements in Figure4 uncovered a trend when HCO3− was the sole buffer: a higher pH increase with increasing HCO3− concentrations due to methanogenesis and homoacetogenesis HCO3−-consuming reactions. This was not the case at 30 mM HCO3−, where we recorded a lower final pH than at 10 mM HCO3− (Figure4) due to the buffering capacity from the remaining 20 mM unconsumed HCO3− (Additional file1). However, in a separate experiment where we increased the total concentration of H2 to 41.2 mmol L−1 in cultures containing 30 mM HCO3−, we recorded a final pH of 9.6 under these conditions (data not shown). These cultures also exhibited slower rates of dechlorination compared to the data from Figure1 and no ethene formed by day 40 of the experiments (data not shown). pH changes resulting from biological HCO 3 − consumption. Average initial (t = 0) and final pH measurements in all HCO3− amendments from this study in the absence (closed symbols) or presence (open symbols) of HEPES. The error bars are standard deviations of triplicate cultures. The buffer HEPES is denoted as H on the X-axis. An increase in pH at all HCO3− concentrations tested was also observed when HEPES was present as an additional buffer but the pH increase was within a much narrower range (Figure4). We ran statistical analyses and determined that, because of better pH buffering, the rates of dechlorination were significantly faster (Student t-test, P <0.05) in the presence of HEPES, compared to when HCO3– was the sole buffer (Figure1). In this study, we show that high pH can also occur in dechlorinating systems, especially in engineered systems fed with H2, and this pH change can negatively impact chloroethenes reduction. A detrimental effect on TCE dechlorination that resulted in accumulation of mainly cis-DCE at pH 8.3 was previously observed in an anaerobic biotrickling filter. Our results show that high pH is stressful to TCE dechlorinating microorganisms, hence, research on bioremediation of chloroethenes will greatly benefit from comprehensive pH studies. Despite the fact that HCO3− is a common natural buffer and addition of more HCO3− can counteract pH deviations from the optimum range for dechlorination, the results of our study point out that 1) high HCO3− concentrations increase the H2 demand, and that 2) consumption of HCO3− contributes to pH increases that could adversely affect TCE dechlorination rates or result in accumulation of toxic intermediate by-products (i.e., DCE and VC). Our findings regarding the effect of pH increases from HCO3−-consuming reactions are relevant for ex situ chloroethenes remediation technologies that provide H2 and for laboratory amendments. When fermentable substrates are used to stimulate reductive dechlorination, or, in the case of groundwater where HCO3− is replenished from minerals dissolution or organics oxidation, this increase in pH will likely be offset by the protons produced from fermentation or by the constant supply of buffer. However, the lessons learned from this study on dechlorination, methanogenesis, and homoacetogenesis highlight that HCO3−, especially when abundant, could be an important variable for biologically-driven TCE dechlorination, as it has a prominent role as an electron acceptor by stimulating competing H2-consuming processes. Our findings also point out that a shift in the main H2 competitors occurs depending on the HCO3− concentration available in the environment, with homoacetogens as the greater electron sink at high HCO3−, and methanogens as the main H2 competitors at low HCO3−. The sediment-free microbial consortium, DehaloR^2, described by Ziv-El et al., 2011 was used as the inoculum. For the experiments in this study, we preconditioned the inoculum culture by growing it in 10 mM HCO3− medium, with excess H2 as electron donor, and two consecutive feedings of 10 μL neat TCE in 120 mL medium. Reduced anaerobic mineral medium was prepared containing the following reagents per liter: 1 g NaCl, 0.06 g MgCl2 × 6H2O, 0.2 g KH2PO4, 0.3 g NH4Cl, 0.3 g KCl, 0.005 g CaCl2 × 2H2O, and 1 mL of Trace A and Trace B solutions described elsewhere. During medium preparation, nitrogen was the sole gas for boiling and bottling and the reducing agents were 0.2 mM L-cysteine and 0.2 mM Na2S × 9 H2O. No buffer was added to the medium before autoclaving. For bottling, we used 160-mL glass serum bottles containing 90 mL liquid and 70 mL headspace sealed with black butyl rubber stoppers and aluminum crimps. The concentrations of NaHCO3 tested were 2.5, 5, 10, and 30 mM. In the cultures where both NaHCO3 and HEPES (pKa = 7.55) were used as buffers, we supplemented 5 mM HEPES in combination with 2.5, 5 and 10 mM HCO3−, and 10 mM HEPES in the 30 mM HCO3− cultures. NaHCO3 and HEPES were delivered to each bottle from 1 M sterile anaerobic stock solutions. The initial pH was adjusted with sterile 2.25 N HCl or NaOH to 7.5 (± 0.1). At time 0, we added to each culture bottle 0.55 mmol L–1 TCE (5 μL neat or 71.3 mg L−1), 1 mL ATCC vitamin mix, 50 μL of 1 g L−1 vitamin B12 solution, 8.2 mmol L–1 H2 (20 mL H2 gas), and 10 mL DehaloR^2 microbial culture, corresponding to a 10% inoculum. The working volume was 100 mL of liquid with 60 mL of headspace. The bottles were incubated in the dark at 30°C without shaking. An additional 8.2 mmol L–1 H2 was added on day 12 (all cultures) and on day 26 (only to cultures still undergoing dechlorination). All experimental conditions were tested in triplicates and the experiments were also performed on two separate occasions. We measured TCE, cis-DCE, VC, ethene, and methane using a gas chromatograph (GC) (Shimadzu GC-2010; Columbia, MD) equipped with a flame ionization detector (FID). The compounds were carried by helium gas through an Rt-QS-BOND capillary column (Restek; Bellefonte, PA). The oven temperature was maintained at 110°C for 1 min, followed by a temperature increase of 50°C min−1 to 200°C. Then, the temperature ramp was further raised to 240°C with a 15°C min−1 gradient and held for 1.5 mins. The temperatures of the FID and the injector were 240°C. Chloroethenes, ethene and methane calibrations in 160-mL bottles with 100 mL liquid volume were performed in a range of 0.05-2.45 mmol L–1. The detection limit for all compounds measured on the GC-FID is ≤0.018 mmol L–1. A GC instrument equipped with a thermal conductivity detector (TCD) was employed to measure H2 before reinjecting additional H2 to the cultures on day 12. The instrument settings used were those previously outlined. The H2 detection limit for the GC-TCD is 0.8% vol/vol. We quantified acetate, propionate, and formate from 0.75-mL liquid samples filtered through a 0.2 μm polyvinylidene fluoride membrane syringe filter (Pall Corporation; Ann Arbor, MI) into 2-mL glass vials (VWR; Radnor, PA) via high performance liquid chromatography (HPLC) using a previously published method. Five point calibration curves (0.5-10 mM) were generated for acetate, propionate, and formate during every HPLC run. The detection limit for the compounds measured on the HPLC was ≤0.1 mM. 0.29 ± 0.06 mM propionate was carried over from the inoculum culture and the final measured concentration was 0.33 ± 0.04 mM, indicative that propionate did not serve as a significant source of electrons. Formate was sometimes also detected at low concentrations (0.1-0.3 mM), however, we did not identify a clear trend on the formation/consumption of this product. Therefore, propionate and formate were omitted from the electron balances in Figure3. The pH was measured using an Orion 2-Star pH bench top meter (Thermo Scientific, USA) that was calibrated regularly with 4.01, 7.00, and 10.01 standard solutions from the manufacturer. All cultures were sampled for gas and liquid analyses until dechlorination of TCE to ethene was complete or until the end of experiments on day 40. Pellets were formed by centrifugation from 2-mL liquid from each culture replicate and they were stored at −20°C until the DNA extraction. Genomic DNA was extracted for two time points for all sets of HCO3− & HEPES, and two time points for the set with 30 mM HCO3− only. Before DNA extraction, the replicate pellets were thawed, resuspended in the supernatant, and combined, so that only extraction per set per time point was performed. This was done to increase total biomass and DNA yield. The DNA extraction was performed as previously described. We employed quantitative real-time PCR to target the 16S rRNA gene of Dehalococcoides and Archaea (TaqMan® assays) and the FTHFS gene of homoacetogens (SYBR Green assay). Triplicate reactions were setup for the six point standard curves and the samples in 10 μL total volume using 4 μL of 1/10 diluted DNA as template. We generated standard curves by serially diluting 10 ng μL–1 plasmid DNA. The primers and probes, reagents concentrations, and thermocycler (Realplex 4S thermocycler; Eppendorf, USA) conditions were those described for Dehalococcoides, Archaea[43, 44], and FTHFS[44, 45]. Acetoclastic methanogens (the order Methanosarcinales) were not assayed because they are absent in the culture employed in this study, which this was confirmed by qPCR previously. Time 0 for all qPCR assays was generated by amplifying genomic DNA from the inoculum culture and assigning 10% as the starting concentrations of gene copies per L culture. The number of me- equivalents for dechlorination is 2, 4, and 6 for DCE, VC and ethene, respectively, 8 for acetate and methane, and 2 for H2. aThroughout this work, HCO3− is used to denote the buffer HCO3−/CO2. At the pH ranges observed in this study, HCO3− accounted for 90% or greater of the two species. This project was supported by NSF CAREER Award Number 1053939 to RKB. The content is solely the responsibility of the authors and does not necessarily represent the official views of NSF. AGD and RKB designed the experiments that led to the writing of the manuscript. AGD and DFW carried out the experimental work. PP participated in the performance and analyses for quantitative PCR. AGD drafted the manuscript; RKB, PP, and RUH critically reviewed and contributed to the intellectual merit of the paper. All authors read and approved the final version of the manuscript.